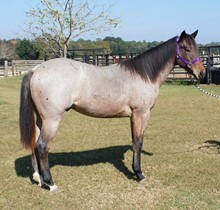 This bay, Figure Four Fritz daughter has been our most productive mare over the last ten years. Over this span she has produced eight live foals and the three that we have sold have made mighty good working horses. We still own five of them. 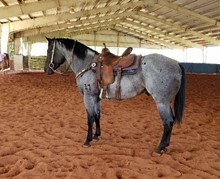 She is the dam of Bo, the super sucessful barrel gelding we own in partnership with Suzanna Hill. Suzanna and Bo will be running barrels in the PCA finals in January 2017 for the second year in a row. Suzanna and Bo have won over $30,000.00 at barrel races and rodeos in the last three years. We made a decision in the spring of 2015 to breed this mare and five others to A Streak of Fame. On April 3, 2016, Seventeen had a bay roan stud colt that just might be her best yet and that is saying a great deal! She is bred back to A Streak Of Fame for another 2017 foal.